Over the years, I have used several types of stooges to launch combat planes (excluding the human type). The first one used electrical cord and a frame built from 2" x 4"s.
If you are wondering what the dirty white stuff is, it is foam core. This had to be added to clear the motor mount and other protrusions that were catching on the rotating hold down. For everything else - Diesel to Fast, 80 to FAI, I have used the wedge type. It has worked for the last 10 years or so, but can be tricky. You need to be aligned properly or you will be scrambling to save your plane or yourself. What you cannot see inside the wedge is an old foam trailing edge the helps keep the plane somewhat straight when it comes out of the wedge. Below are photographs of Ken Burdick's new stooge, which is a variation of the wedge. The plane is held inside a carpet sleeve. The wood is rotated and held in place with a clamp. Allowing the wood to rotate will let you set it for specific planes. You still need to be careful when pulling the plane out of the stooge. The photos show 80s, F2D, and Half A in the sleeve ­ not all at the same time. The legs are removable from the platform. At the 2007 Regionals, Mike Rule had a stooge that solved all the problems I had encountered with stooges (the mechanical ones). I asked Mike if he had plans and he said no, but he would come up with some. A few weeks later, I got an email with a link to Mike's webs site. Mike had taken a bunch of pictures and placed a yardstick on the stooge so I could get dimensions. Go to Mike's web site to see his stooge. When I saw Mike's stooge I knew there were a couple of changes I would need to make. First Mike is a big guy and he drives a BF'ng truck. So when I set out to build my stooge, I would have to make the legs foldable or removable. The wedge stooge I have been using combined both. 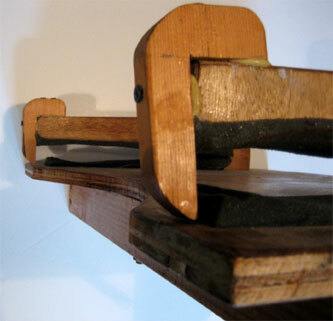 Secondly, with folding or removable legs, the shelf would have to be redesigned. The second issue was finding materials that could be purchased rather than something out of a surplus store although it is OK to go through your scrap wood box. When I started this project, Boeing Surplus was still alive and well. Caution: If you decide to build a stooge, you assume all risk and responsibilities. This article documents the development and construction of a stooge. Before you start the project, take a good look at the photographs and get familiar with the stooge. Since I am writing this as I build the Stooge, I am enclosing what I tried and what did not work. So you get to see a little bit of the process. Secondly, if you decide to deviate, then you may find out what does not work before you waste time. Because I have another project under construction that requires I use CAD, I am learning AutoCAD Light. I am preparing a CAD drawing for the Stooge. This CAD drawing will be converted to a PDF and if John does his thing correctly, it will be attached to this article at a later date. Just use your Adobe reader to open. Caution: Do not run your hand through your table saw, band saw, skill saw, scroll saw. Caution: Wear safety glasses. If you are blind, do not operate power tools. If you are drinking, drunk, on medications, or arguing with your wife stay away from power tools, hand guns, rifles and power nail guns. To start the project, begin with cutting the top deck. My scrap bin had 3/4 inch plywood so this is what I used. Caution: If you are driving to the lumber store, drive carefully. Buckle your seat belt. Do not back over neighborhood children, pets or parents. Obey all traffic laws. Look both ways before crossing the street. Do not drive over open draw bridges. Drive on the correct side of the road. The curved radius is important. This radius is used to clear the prop, metal motor mount bolts, and glow plug clip wire. You could probably use 1/2 inch, but no thinner. Note that the bottom frame pieces will be set behind this radius. The Photo shows the slots for the restraining arms (torque box) already cut. Cut the two torque box restraining arms. Again, I used 3/4 inch plywood, because I wanted a lot of surface area on the top surface to attach the foam. Secondly, the rear of the arms (the round part) carries a lot force. Once you have these, lay them down on the base, and mark the rear slots for the arms. If you start making changes to the dimensions, make sure you consider the impact. Cut the slots and allow at least 1/4 inch clearance. Take care to get these slots straight. If you do not, when you build the torque box, it will bind. Now you are going to build the torque box. I used 1/2 inch plywood for this. Cut the front, back and bottom. Take some wood clamps and assemble the two arms, front and back together. Take the top deck and clamp so you can slip the torque box into the slots. At this point, get a plane and position it on the top deck and check your work. The torque box is attached to the base from the bottom using hinges. Check for clearances. It is better to solve the problem now before going crazy with wood screws. If you are satisfied with fits and clearances, remove the torque box from the top deck and assemble it with wood screws. Take the torque box and your hinges and set the torque box in the top deck and locate where hinges will be attached and attach the hinges to the bottom of the top deck. I used National 3 inch non-removable pin hinges N-146-373V518. Do not attach the hinges to the torque box. Do not attach the hinges to the torque box. Yes, I typed this twice. Cut the Frame pieces for the top deck. My wood scrap bin did not have anything so I bought 1"x 4" for this. Since the legs will be attached to these, make sure you cut and assemble them with care. If you do not have a framing square, borrow one. Mine came out as square as I could get it with the quality of wood I was using. Caution: Do not put wood screws in your mouth. Do not swallow wood screws. Do not stick the screwdriver in your eye. Do not clean your ears with the screwdriver. Take the top deck and the frame pieces and attach with enough wood screws to hold every thing in place without it moving. Get the torque box and insert and check clearances and movement. If everything is smooth, square and clear, then finish with the wood screws. Caution do not breathe Varathane Fumes. Paint in a well ventilated area. Wear proper protection. Do not put a condom over your head and try to breathe. Do not go into a convenience store wearing a stocking over your head. Give everything a coat of Varathane Spar Varnish. The top deck gets multiple coats. I used one can for this. While things are drying, call McMaster Carr (Part Number 5126 A47) or Small Parts and order a vertical hold down clamp (McMaster Carr Part Number 5126 A47). Depending on your scrap source you are going to need a piece of metal angle at least 2" x 2" x 3" long. I use Online Metals. Call in your order and wait for UPS to show up. While you are waiting for the Varnish to dry, get the materials for the legs. Figure out how tall you want to make your stooge. I find that 36" works well for me. I used the 1" x 4" for the legs. Do not go any thinner. The 1" thickness is right at the lower limit. If you do not build the shelf, you will need to go to at least 2" X 4" for the legs. Carefully cut the legs making sure they are all the same length. Caution: Do not run your hand through your radial arm saw. As far as that goes, do not run it through any body parts. And while we are at it, do not fall into a wood chipper or go to sleep on railroad tracks. Caution: If your wife is giving you grief about this project, do not duct tape her mouth or CA her to a chair. Set the torque box in position and take the hinges and attach to the base. Do not attach them to the torque box. You need to decide what bolts and nuts you are going to use. My scrap bin (the old coffee can) did not have what I wanted so when I went to get the wood, I got bolts and blind nuts. In selecting the bolts I wanted something that I could use a prop wrench to tighten them, this turned out to be 1/4 x 20. I selected blind nuts to keep the number of parts down that I could loose taking this thing a part. Because of the slight difference in hole positions, using blind nuts has forced designating legs to specific positions. Although the blind nuts worked, I decided to abandon them and go with wing nuts. The blind nuts take too much time to align. Initially I did not use washers on the bolts and could not get the legs tight enough. A second problem is the legs are a little springy ­ long and thin (See the discussion above about wood size for legs). I had considered going with 2" x 4" but did not want the extra weight when it came to hauling this to the field. Secondly adding a shelf for the pit box should resolve the problem. You have probably wondered why I have not attached the torque box. By now, the answer should be obvious. But if you have not figured it out, there are two reasons. First is the Varathane is taking longer to dry since this is being built in December, secondly the work being done is easier without the added weight and protrusions. Figure out where the bolts need to go, and drill all four legs identical. This will make assembly very simple. I attached a leg to the frame piece with wood clamps and made sure it was square. I used the framing square to make sure the leg was square. I took a second leg and did the same thing to the diagonal. Next, put a straight edge across the diagonal and check that the legs are level. Adjust and recheck square and mark the holes. Drill the holes. Repeat the process for the other two legs and attach the legs. If you did everything, correctly, the top deck is level and the legs do not wobble. Take and set the torque box inside the top deck and wait for UPS to show up. In my case, I was not planning on being isolated from civilization because of a bridge being closed for two days and land slides. Depending on what you plan on using for the cradle material, it is time to do some experimenting with shapes and glues. The cradle is the shape of an airfoil. This means that if you break the cradle on the center line, when the plane comes out of the cradle, it is initially going to angle at 45 degrees or greater. At least that is my theory as I write this. I will update this latter after I get a flight out of the stooge. Before you can take on this issue, you need to get the material. Mike used foam rubber on the top of the cradle. Now where do you find this stuff. Upholstery supply shops are a good place to start. I found mine at a store that specializes in foam. Foam comes in various densities. I got the most dense available. Not knowing if this would work for the bottom of the cradle I bought some Buna ­ N rubber from McMaster Carr. The plan was to use the rubber for the front and the foam for the rear. Since I bought 1/2 inch rubber, I needed to get a glue to hold it together. After an internet search, I had it on my work bench ­ CA. I glued some small pieces together and experimented with cutting relief slots. I cycled these a few hundred times and they appear to work. I also took the foam and had someone hold it on the work bench and put a plane into and pulled the plane. Looks like the foam might work. I found that CA, Sigment, and Tightbond all worked for the foam. I have yet to try silicone bath caulk. The first cradles are being made from the foam rubber. The rubber does not cushion the way I had expected. UPS showed up with a very large and heavy box. I had called the order in the day before to Online Metals and since they are in Seattle, I can get next day service. To get that box to my house, the driver had to come 11 miles down the Northshore Road and then up 400 feet of switch back to ultimately get to my house. Normally not a problem, except there is a landslide every half mile consisting of silt, logs, running water, and work crews trying to keep the road open. After a discussion with the UPS driver that the box was big and heavy for what I had ordered and an update about cars buried in mud and damage he had seen, he left and I opened the box. Well inside were several pieces of steel tube and the order paper work for some guy in Florida. I called the guy in Florida and told him do not plan to start your project and then I called Online Metals. The Varathane on the torque box finally dried and it is time for the next coat. While I am waiting on this to dry, I am working on a solution for the shelf. Where is Norm Abrams and his New Yankee Workshop when you really need him? Adding the pieces for the shelf eliminated the springy leg problems. Again, one of the goals in putting this together, is to have something I can haul to the flying site and not need a wheelbarrow to carry all the pieces. So far, there are four legs, four shelf supports, 1 shelf, and one top assembly, and 16 bolts and 8 wing nuts. Initially I built the shelf supports out of 3/4 inch plywood that I had ripped with my table saw. Since I am down to the bottom of the scrap bin, the plywood looked like it had been ripped with a chain saw. Off to the lumber store. I found a straight piece of 1" x 4" pine and ripped it to 2 inch. Now the way these attach to the legs, you have to offset the holes. This can be done with a little care. Since I have decided to abandon the blind nuts and the pine is thicker than the plywood, I need to get longer bolts 1/4 x 20 x 2 inches long. One option I considered was detaching one side of the self support pieces and rotating and reattaching to the legs. The bolts that attach the legs to the top would be put back into the legs. I abandoned this and decided to attach all the pieces to the shelf. Down to four legs, a shelf, and the top assembly. A little work with the drill, legs and shelf supports are attached to the shelf. We are now down to something you can walk to the site carrying the top assembly in one hand and the legs and shelf in another. Set these aside and Varathane. Once the Varathane base had dried, I went back and gave the entire assembly three coats of fuel proof dope. I do not know how many projects I have worked on where someone said here is what I used and when you ask where did you get it the answer would be someone gave it to me or the Boeing Surplus. DANGER, DANGER. You will never find this part so do not waste your time; figure a different method. I ordered a Hold-Down Toggle Clamp Open Arm, STL 600_290# Cap, Neoprene Tip Spindle (McMaster-Carr Part Number 5126 A47. Drill the holes for the latch assembly. Counter sink the top screws. Take the latch assembly and drill a hole through the handle and set up the release wire connection. Attach the latch assembly to the underside of the top. Take the aluminum angle and position on the torque box and attach with a wood clamp and test the latch assembly. Now the moment you have been waiting for, attach the torque box to the top assembly. When I did this, I had a slight interference at the rear in the full open position. I think the wood expanded when I Varathaned the pieces. A little sand paper work and the problem went away. With the unit upside down, using lag bolts attach the spring. I had a few old springs lying around and found one that worked. The spring is something you will need to customize for your device. I will get a couple of springs to experiment with. Although the spring worked, I over stressed it and now have a junk spring ­ the price of experimenting. Go to a hardware store that has springs on display. I found a couple of automobile springs to try. A universal automotive 3/4" x 17-1/2" worked for this setup. What did not work was a universal automotive 3/4" x 4-3/8". Take and assemble the unit and grab a plane and see if all this work was worth it. Take your foam cradles and place them into position and set your plane into the cradle and add the top cradle. Do not glue any of this. You are checking thickness and fit. Clamp the plane in place. You will need to adjust the clamp to get the correct tension. This clamp works well - do not substitute. Well the cradle worked with a foam 80. I put a built up fast plane into the cradle and clamped down ­ no broken ribs. Next was a new D-bat. No use in stinking this brand new stooge up before it gets out of the shop. Next test was two FAI planes a foam and a ribbed, and the final was a couple of 1/2 A's again foam and ribs. OOPs, there I stood with an 80 in the stooge. The 80 has external controls. When I looked down and saw how tightly the plane was locked in immediately I wondered about the lines. I typically like control at launch. I took a look at Mike's stooge and there was no special line path. I pulled out a set of line and hooked them up and locked the plane into place. To my surprise, they moved easily under the foam. Problem solved. I hauled the stooge from the shop to the flying circle at my house. I do not have the grass in and normally do not use it, a layer of snow provided a nice soft landing area. I set everything in place and attached a heavy duty string to the release. Started the engine and picked up the handle and string and gave a pull. I did not take the time to adjust the release mechanism to the plane in the stooge and it was clamped down tight. When I pulled on the string, nothing happened. The string was a little stretchy ­ well more like a rubber band. A good hard tug and the latch released and a perfect launch. I bought a Chalk Line from the hardware store and took it apart and removed the wimpy string and replaced it with Dacron fishing line. Last step was to add a line clip since I will use this on my stunt stooge as well. We went flying today and I took the Stooge out for more testing. I wanted to test some 80's that had been repaired. On the first launch from the stooge, the airplane did not come out straight. The inboard released first and then the outboard, which produced a left turn and then a ground encounter. Looking at the foam and pulling the plane straight revealed the problem. The bottom of the outboard foam cradle was releasing first. To solve the problem I did some foam pruning and placed the plane on top of the leading edge cradle. No problems the rest of the day. I am going to try the rubber sprayed and wetted with fuel. Secondly, I made the legs all equal length. The airplane comes out horizontal to the ground. I am making a second set of rear legs that are shorter. This will give an angle. I am going to start with a shallow angle and will trim if I need more. The shallow angle made a slight difference. To get a real steep angle will make the stooge tail heavy. It is better to keep it level and give a little up a release. I suggest before you take your stooge out to the field that you place an airplane with engine mounted in the cradle. Take a piece of string and tie it around the shaft and pull slowly. Do this several times to make sure the plane comes out straight. If it does not trim the foam cradle material until it does. I abandoned the wetted rubber solution. The foam works just fine. Caution: If I missed something in the caution notes and you did something stupid, it is your fault, not mine. You have assumed all responsibility for the project and its use. If all else fails, Dial 911. I was walking to my handle one day and running the lines when I heard the plane release. Not something you want to happen. Fortunately it nosed into the ground with the only damage being a broken prop. I tightened the holding mechanism and things appeared to be solved. A few flights later, the exact same thing happened. I went home and added a positive restraint to the release arms. This winter I plan on revising these using music wire. Photo at right shows the update with the positive restraints.